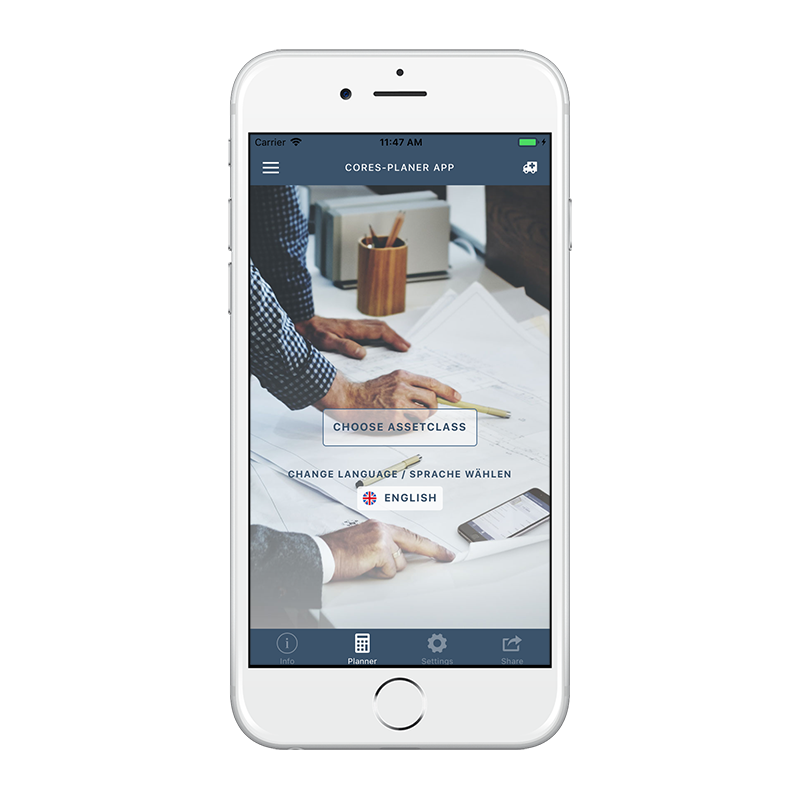 Cost estimation app for real estate Professionals. 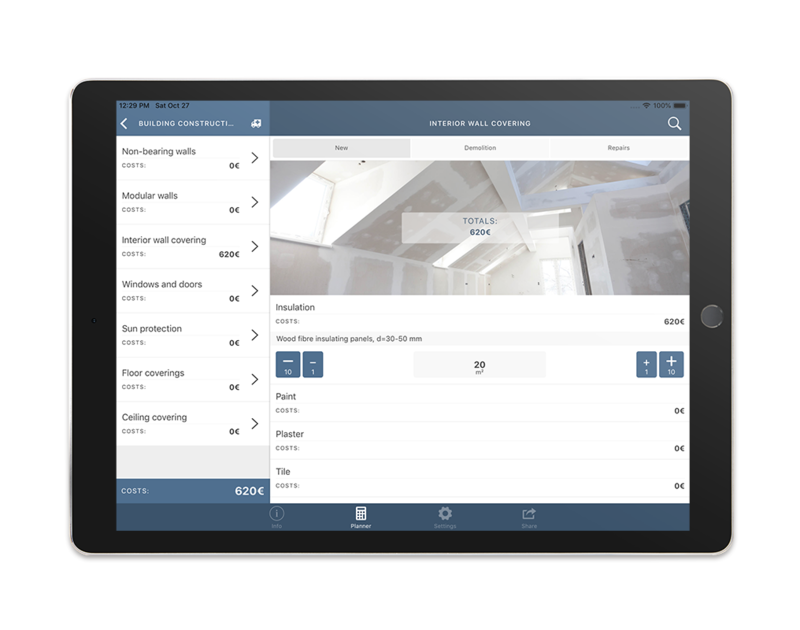 THE App for Professional Real Estate Building-Cost Estimates. As an investor you face the problem of budget planning and you need indicators very quickly? Contractors submit cost estimates for conversions and repairs and you need a base for a cost comparison? 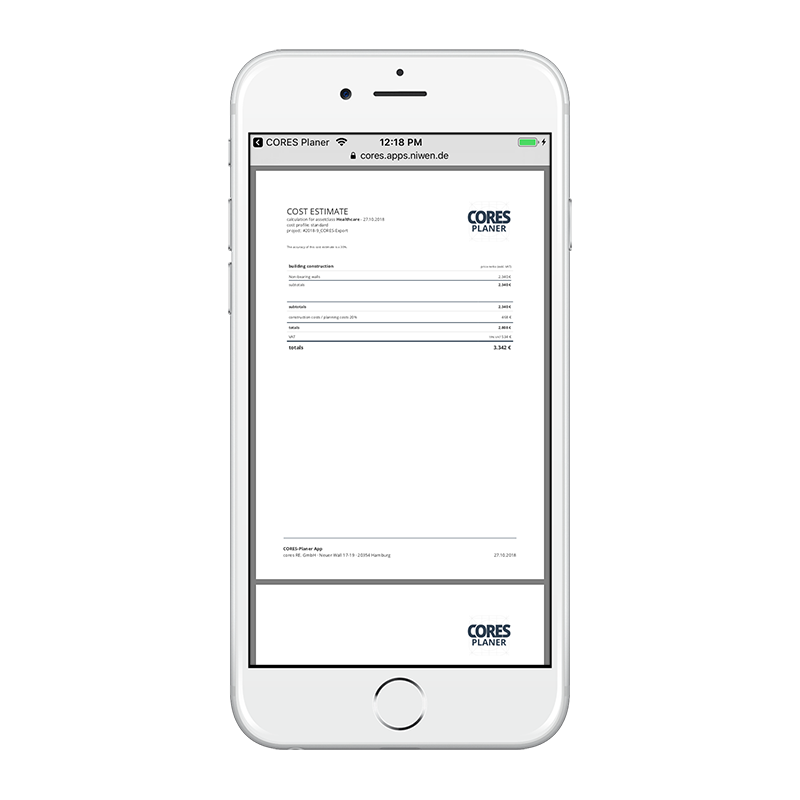 Your tenant requires conversions to be made on the premises and you need the cost per component calculated and printed out for upcoming contract negociations? A reinstatement obligation must be served or decorative repairs are due and you would like to calculate the anticipated cost while inspecting the site? For Asset Managers, Property Managers, Brokers and Investors. 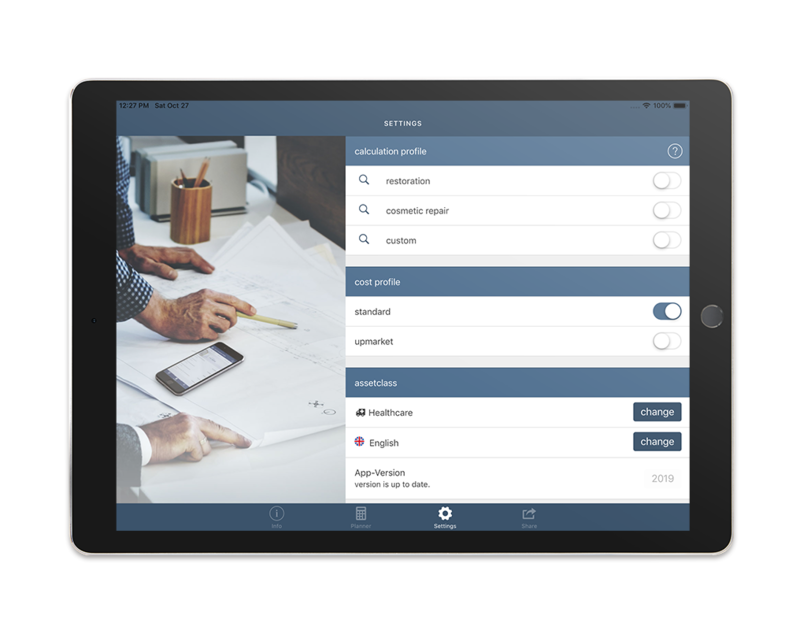 CORES Planer App is a useful instrument for creating indicative cost estimates for demolition, construction, refurbishment, maintenance and inspection costs within the asset classes healthcare, office, and residential. The app is directed towards professional users such as asset managers, property managers, brokers, and investors in the real estate business and facilitates an immediate overview of the anticipated expenses for refurbishment measures. 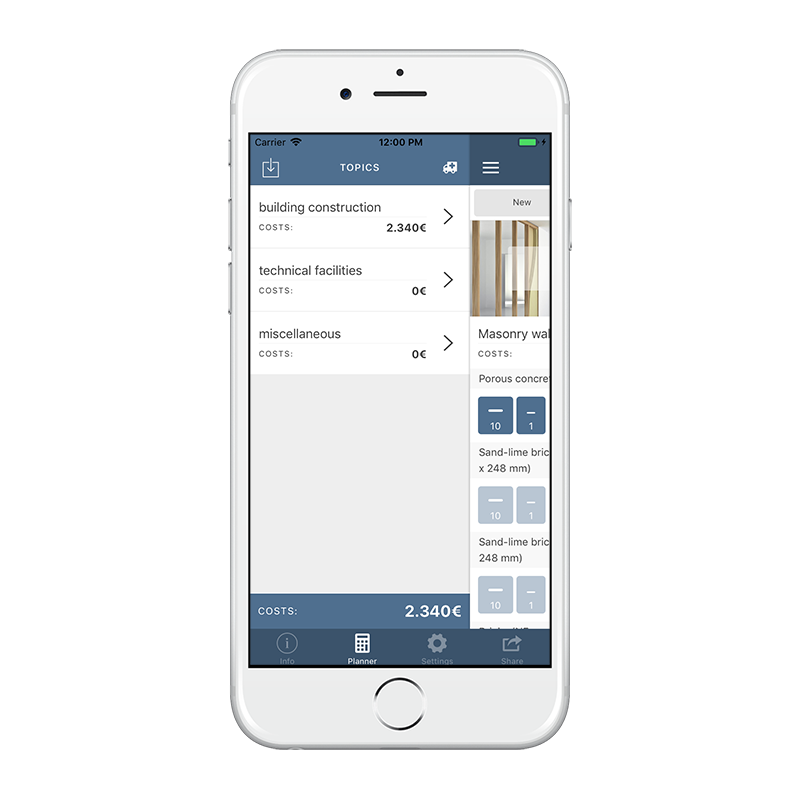 This app gives you fast, no-frills calculations of conversion, modernization, demolition or refurbishment costs and for the maintenance costs of a property on site. The cost estimate can provide the basis for budget decisions, decisions about construction measures or setting the budget for a future project. 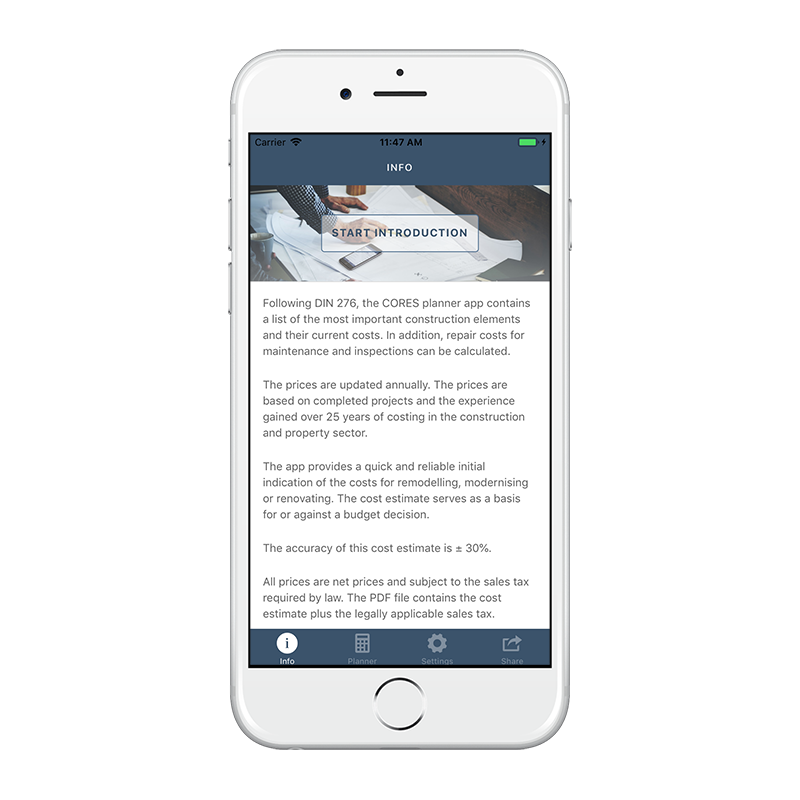 Arguments used in lease contract negotiations can immediately be documented and backed by numbers with the CORES Planer App. Various basic settings such as a selection of cost profiles, reinstatement obligations or decorative repairs facilitate and accelerate handling. Over 25 years of experience in the construction and real estate industry provide the basis for this app, which incorporates 7,000 current price indications based on DIN 276. Just a few entries such as the area scheduled for modernization in m2 or the maintenance interval of an elevator suffice to provide a calculation. The menu navigation system assists the user by listing all the essential parameters for the creation of a budget. 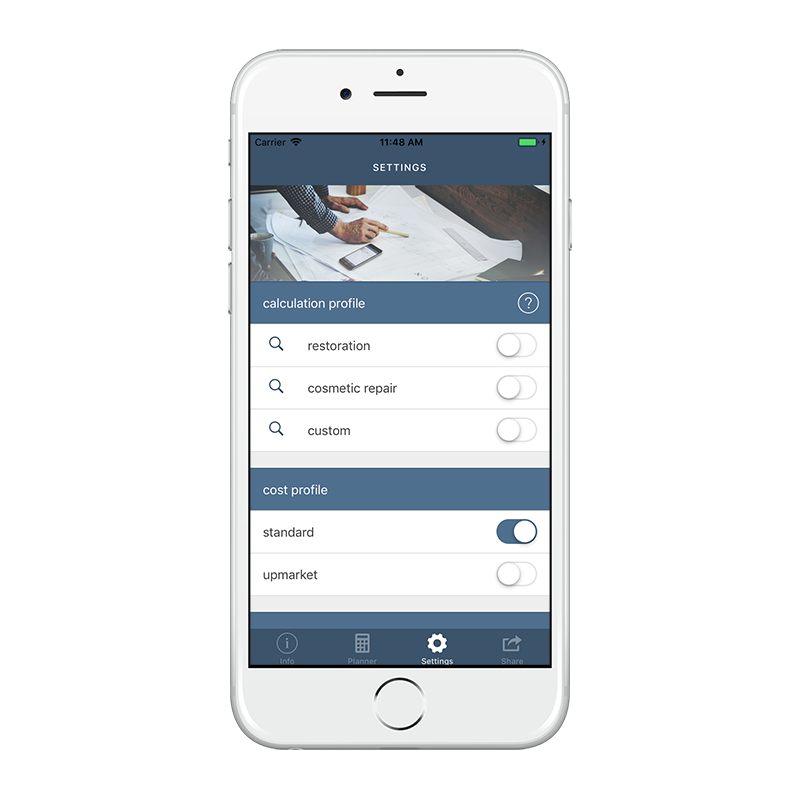 The app accesses databases with the corresponding cost key values that are updated annually, including labor, material and construction costs. A sendable PDF file listing the planned measures and the user-assigned project name contains the volumes and quantities as well as the calculated results. CORES Planer Start Language SelectionHomepage of the CORES Planer app. Here, e.g. Use the info button to start an introduction explaining the functions. CORES Planer IntroAn introduction to the app features as an online help. 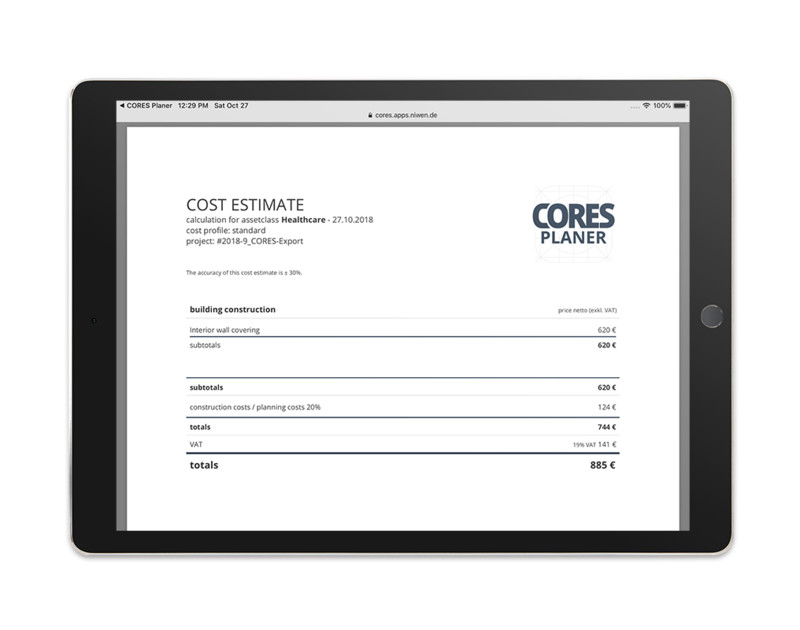 CORES Planer App SettingsSettings for the cost and calculation profile of the user. 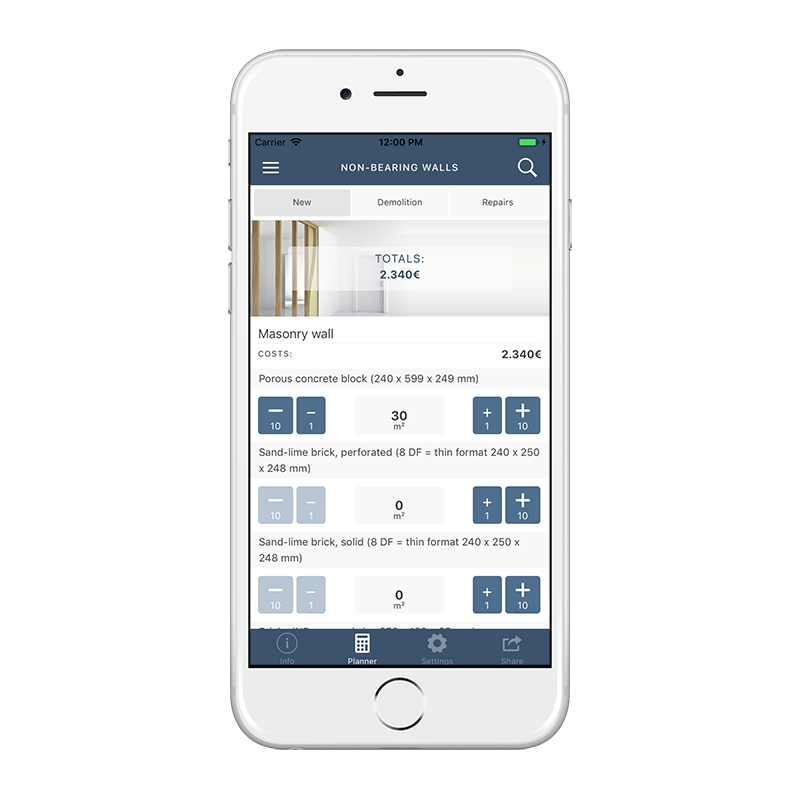 CORES Planer Asset ClassesSelection of asset classes in the CORES Planer app. CORES Planer TopicsSelecting the active calculation area in the CORES Planer app. CORES Planer Cost CalculationInput field for quantities of the selected construction element. CORES Planer Export PDFProjects can be exported. CORES Planer ProjectnameDesignation of the project for the resulting Report. CORES Planer Cost Estimate PDFThe building cost estimate as exported project PDF. Identical functionality for iOS and Android apps. As of November 2018. Larger property and extensive real estate projects are teamwork. 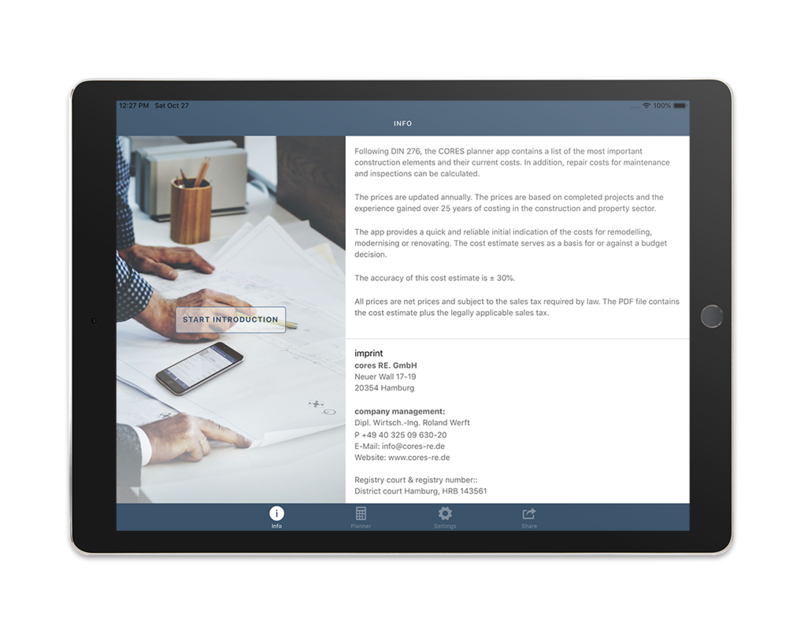 The CORES Planer app can be largely adapted to the needs and wishes of any professional user group. Achieve cost benefits through a scalable licensing model and stay up-to-date with annually renewed data in convenient subscription terms. 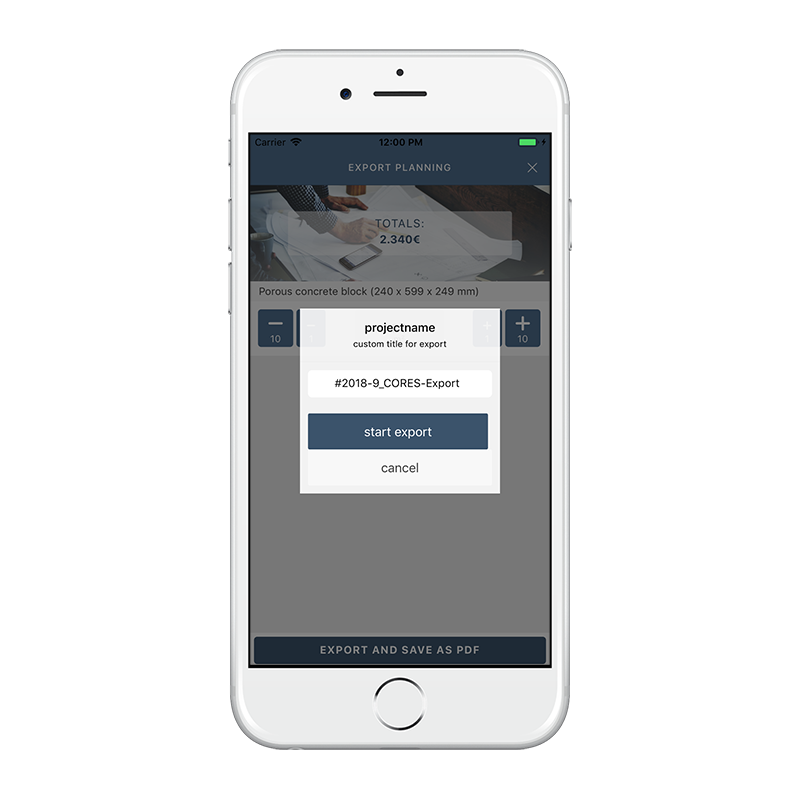 In addition, you always have the opportunity to personalize your CORES Planer apps and reports with the integration of your company logo or a special output data file format for smart IT integration. GET A FREE DEMO on the App Stores. ...to questions prior to purchase (FAQs). How are the cost parameters updated with the new values for 2019 ff.? The cost parameters are updated every November. 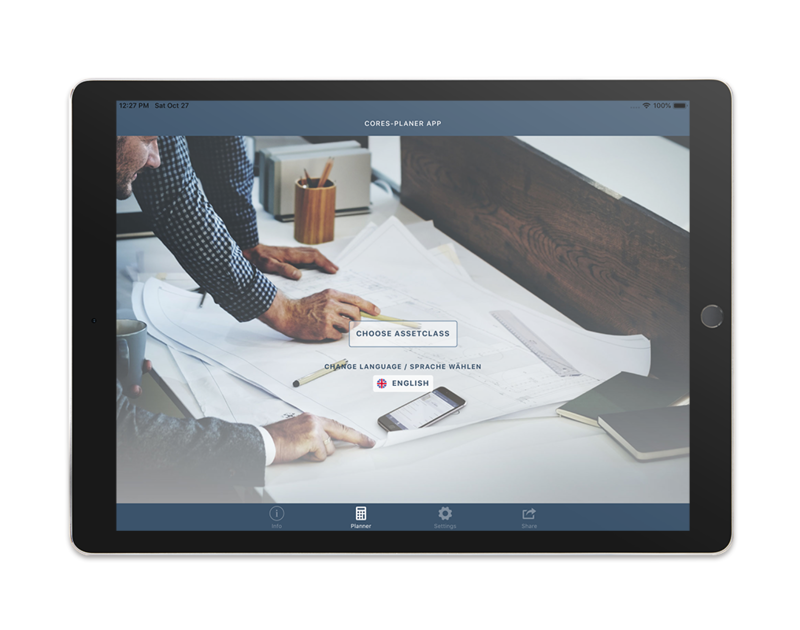 Generally, the update of the CORES app is realized by purchasing the new version. 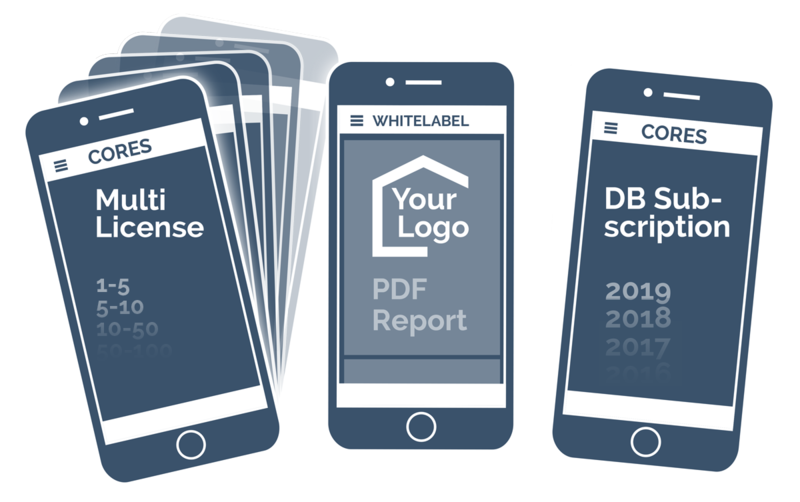 However, we also offer licensing and subscription models, which ensure the use of the most up-to-date cost parameters without the need to re-purchase the app. Is there a scaled-down version available for those who don't need all the features of the CORES Planer App? There will be closed user group versions of the CORES Planer App available in the future. The scope and the scale of the app can be individually determined for these groups and commercial users can also get customized printout options suited to their needs. Can you have your own company logo on the printout / PDF? For commercial use within closed user groups the respective logo can be integrated, so that the PDF or the printout of the calculation / the cost estimate could be directly dispached to their customers. Can the PDF be converted to other formats for further processing as an Excel sheet or in ORCA data formats? Basically, the inputs are displayed as PDF. For commercial use within closed user groups, a technical solution for output in another file format is possible. Can the calculated costs replace a tender? The cost parameters can be used as an indication and give a first indication of the amount of the costs of one or more measures. Since the components and masses must be determined for the indication, this initial recording can facilitate a tendering process based thereon. Is there any difference to the data collected by the BKI? BKI data is not used directly in the apps. Cores RE. updates cost parameters even during the year and is faster and closer to the market price than the BKI in case of cost fluctuations.